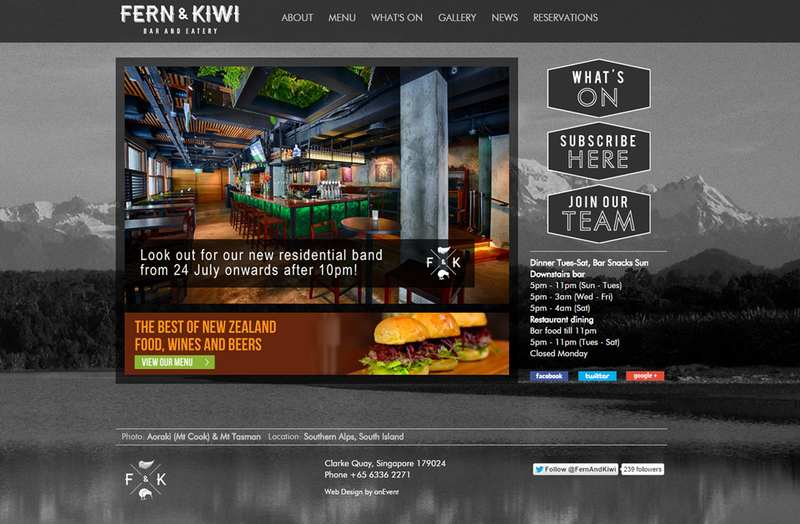 Fern & Kiwi offers the best of New Zealand food, wines, beers, music and live entertainment; all served in a friendly, fun atmosphere, typical of the legendary Lone Stars. Conveniently located right next to the Clarke Quay taxi stand, F&K is here to prove that New Zealand is not as far away as you think. Working with the F&K team from the ground up, onEvent was proud and excited to have been involved with the development of the website plus email marketing during the construction of the venue itself. This gave us a good concept of the message that the website had to send to the target audience.